The College of Physicians of Philadelphia Digital Library | "In Blissful Ignorance of Their Fate." Image from Shall We Slay to Eat? by J.H. Kellogg M.D., published in 1899 by Good Health Publishing Company, Battle Creek Michigan. 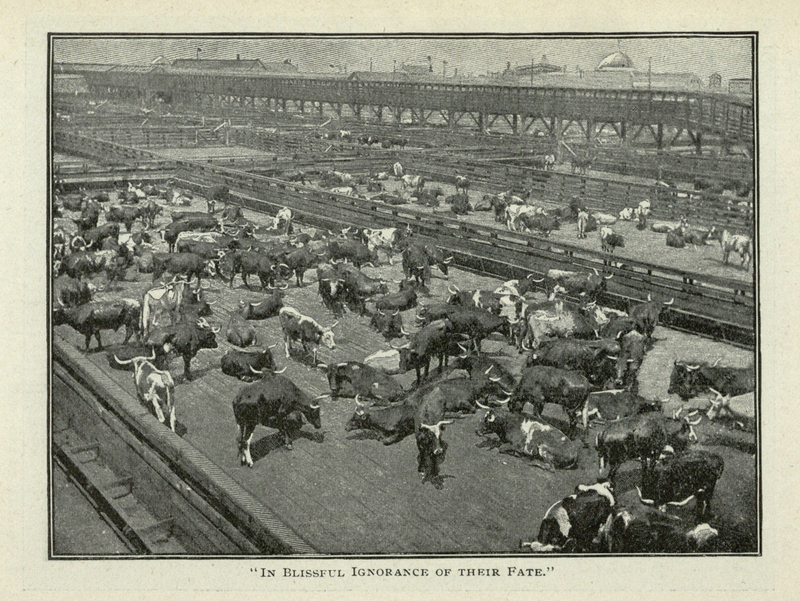 In the volume Kellogg, founder of The Battle Creek Sanitarium and the Kellogg's Food Company, outlines the "non-use of flesh food as an article of diet," discussing both the health benefits of a vegetarian diet as well as the cruelties of the abattoir. Good Health Publishing Company, Battle Creek, Mich.
Kellogg, John Harvey, 1852-1943., “"In Blissful Ignorance of Their Fate. ",” The College of Physicians of Philadelphia Digital Library, accessed April 23, 2019, https://www.cppdigitallibrary.org/items/show/5029.